Sea bream has to be one of my favourite white fish; it’s delicate yet meaty and can stand up to bold flavours if you strike the right balance. In this recipe I have used Indian spices as a crust and then stuffed the bream with lemon slices and kaffir lime leaves to freshen it up even more. If you’re nervous about cooking a whole fish then don’t be- it really couldn’t be simpler. Ask your fishmonger to prepare the fish so it’s ready to go if you don’t fancy doing it yourself! One fish should serve one person so it is really simple to double this recipe if needed. 1. Preheat the oven to 180c/ 160 fan ready for the fish. To make the spice paste roast the cumin, coriander seeds and peppercorns for a few minutes until they are lightly toasted and release their flavours. Pop into a spice grinder or a pestle and mortar along with the chilli, garlic, ginger and salt and grind to a coarse paste before mixing in the oil. 2. Get the fish ready by stuffing them with the slices of lemon and lime leaves. Grab your spice paste and rub the fish all over with it. Pop the fish on a lightly oiled baking tray so it doesn’t stick and cook in the oven for around 15-20 minutes (depending on the size of the fish). If the spice crust starts getting a bit too much colour on it then cover the fish with a piece of foil. When the fish is ready the juices should run clear and the flesh should look white and translucent. Serve with rice or salad for a lighter meal. 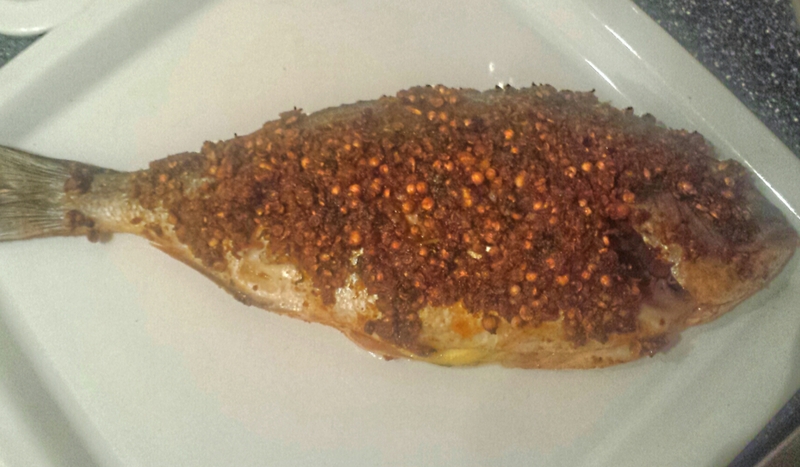 Spice crusted sea bream- a celebration of this stunning fish! This entry was posted in Recipes and tagged fish, sea bream, spice by sotiris14. Bookmark the permalink.